Incense has the power to purification, transformation and can send your prayers and petitions to Deity. As the scented smoke rises, we are uplifted as we envision our intentions and prayers rising up with it. The following ritual has been used by people for millennia, be mindful that you are making a connection to your ancestors and to a traditional spiritual way that brings harmony and comfort. 1. Use loose incense or dried herbs on a lit charcoal disc, or you may use pre-made incense sticks or cones. 2. Using a flameproof container, heap the incense in the center and light it. 3. Make a clear intention, silently or aloud. Light the incense. 5. Visualize your prayer or petition becoming one with the smoke. Take some time and watch the smoke as it curls and wafts upwards. Imagine that the smoke is carrying your prayers to the God/dess. 6. 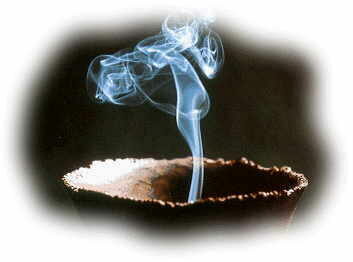 Once the incense is completely burned out, give thanks aloud or silently. Give the ashes to your houseplants as fertilizer.